"I came up with this recipe for a recipe contest, and it's been a family favorite ever since. For a lighter version, omit stuffing the meatballs with mozzarella cheese. Serve with your choice of pasta." Place the ground turkey, onion, garlic, egg, bread crumbs, Parmigiano-Reggiano cheese, parsley, pesto, milk, salt, and black pepper in a bowl. Mix until evenly blended, then form into 1 3/4-inch meatballs. 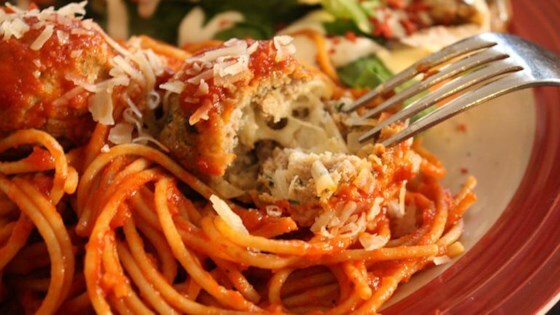 Make a hole in the meatball with your finger and place a cheese cube in the hole. Seal the meatball around the cheese and place on a nonstick baking sheet. Drizzle the olive oil over the meatballs. Bake in the preheated oven until the meatballs are no longer pink in the center, about 30 minutes. Heat the marinara sauce in a saucepan over low heat. Bring to a simmer, and place the baked meatballs in the marinara sauce for about 2 minutes. Good, but was not able to form into meatballs, had to make meatloaf instead. To cut back on calories, I used fresh basil from my garden, eggbeaters, and no olive oil. I cubed low fat string cheese instead of fresh mozz. easy and delicious. my 7 yr old was very impressed with the cheese inside the meatball. "how did you do that Mom?!" My husband and I loved these! I did make a couple changes since I didn't have all the ingredients. Instead of bread crumbs I used oats and didn't add the pesto but it was still quite tasty! so very delicious! If you're watching calories, use fat free mozzerella and lean 99% fat free turkey. Delicious! I love pesto and these meatballs were great! Definatley going to make these again!